Hi there, I usually make a very unique (and complicated) costume every year, but recently took a couple years off, (due to a new baby and work). So this year I decided to step it up a notch and even top the last “illusion” costumes I made in previous years. 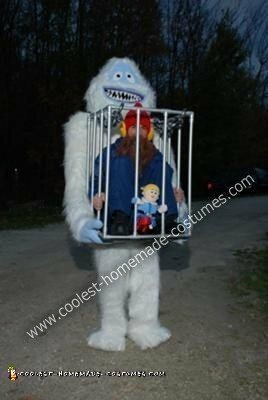 I came up with the idea from a gorilla/caged person I saw on the internet and incorporated the Bumble and Yukon theme into it! I made the cage from 1/2″ PVC pipe (local hardware store), with the core of the arms and shoulders also 1/2″ PVC connected via t-connects to the side of cage and cemented them all together. The bottom of the cage is 1/8″ ply (local hardware) screwed into the bottom and the back of the cage is cut out of the bottom where my body goes through into the Bumbles legs. I hold it up with a back support strap (local hardware) that is sewn into duck cloth. The duck cloth is fabri-glued to the bottom of the cage and tied at the corners for extra support. The top of Bumbles knees are then sewn into the bottom of the cage with holes that my legs go through to represent his legs. The body of Bumble is made of a king sized foam mattress cover that is cut and shaped… chest and arms. The head is made of 4″ foam blocks (craft store) that I stacked and glued, then carved out the shape of the head. All of the fabric materials (craft store) were simply glued to the foam, and at the seams using fabric glue and spray adhesive (I had sewn my previous costumes but found it too time consuming and found that fabric glue is almost as strong and cuts the time into a fraction). I found the snow-pants, coat, and boots at a thrift store. I had my grandmother sew the hat and earmuffs. 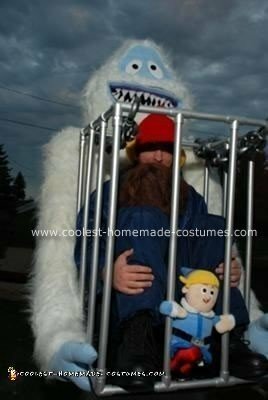 Purchased the beard and chains (top of cage) at a local Halloween store. Also just fabri-glued fabric to some big puffy slippers I had found at the store. I started about 2 months before Halloween so I could take my time, putting in a couple hours here and there. All and all I think my homemade Bumble captures Yukon Cornelious costume turned out pretty good, and my friends went crazy about it! I’ve seen the capture in a cage thing alot, but never like this! This is hilarious! I forgot to mention… I made the dummy legs and feet(Yukons legs) out of 1/2″ PVC pipe slipped into pool noodles and wrapped in cotton, then slid into pantyhose. I made the thigh and shins separate to make them look as lifelike and real as possible (bending at the knee, or hanging out of the cage). People were actually grabbing my legs and they feel so real that people were thinking I had somebody else actually inside bumble carrying me around. It was a riot! …and to the tune of one of my childhood favorites. Your attention to detail on the character is fantastic. Right out of the show! This is one of the best costumes I’ve ever seen! Well done! that is the best costume ever..I can’t wait to see what you come up with this year..nice to see people still put hard work into their costumes!!! WOW! 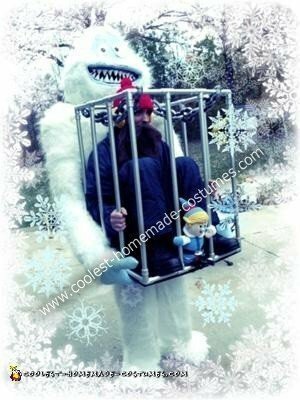 This is a simply incredible costume!!! You are very creative and talented! Any chance you would be willing to make this costume for someone else for the right price??! I would love to have my own Bumble. Bumbles rock! I realize this is very old, but how do you get in/out of this costume? Hi there! I was wondering if you had some pics of the process? I love this costume and will be making it for next year. Would love to see some pics during the creation to get some ideas.